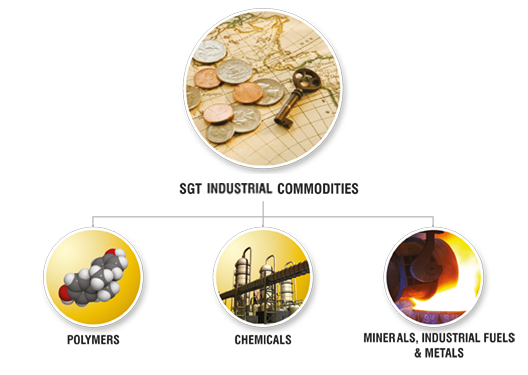 SGT Industrial Commodities is a global player in the minerals, industrial fuels, metals, polymers and chemical industries. Backed by an outstanding financial portfolio and efficient logistics services, we have all the suitable gears to facilitate our clients’ business. We are the premier supplier of minerals particularly iron ore and chromite ore , as well as industrial fuels such as coal and coke, with an exceptional access to hundreds of mines in the Middle East, Africa, CIS, Eastern Europe and South Asia. We also deal with metals such as steel plates, rebar in straight and coil form, hot rolled coil, sections, billets, wire rods, seamless pipes and longitudinally welded pipe. SGT Industrial Commodities is the leading stockist and broker of polymers in the Middle East. Our products include natural/ synthetic rubber and leather, as well as many other polymers. We are also an active distributor of various chemicals which are used in the rubber and leather industries. © 2016 SGT. All Rights Reserved.